CUCUTA, Colombia: The soldiers blocking humanitarian aid from entering Venezuela look unlikely to give any ground, but Maria Acevedo thinks she knows how to make them let the shipments through. Maduro, who is locked in a power struggle with opposition leader and self-declared interim president Juan Guaido, refuses to let the aid through. He calls it a "show" and says Venezuela's humanitarian crisis has been manufactured by Washington to justify a "coup." What happens to the sea of shiny white plastic bags filled with vital supplies - and to Venezuela itself - now hinges on the military, which has so far stood by Maduro. She should know - she comes from a family of soldiers. "I come from a military family, too. And my family is against this, against the army blocking humanitarian aid. "But my family can't do anything. Only the top brass," Acevedo told AFP in Cucuta, on the Colombian side of the border. She regularly travels there to buy the food she can no longer find in Venezuela, a once-booming oil giant that has skidded into a devastating economic crisis under Maduro. "We women are the ones who have to help get this humanitarian aid through. Not the men," she added. "They may be strong, but they can't do much because the authorities would immediately attack them." There is history behind Acevedo's hope. It was seen most recently on Tuesday at President Donald Trump's State of the Union address, where several dozen opposition Democrats used their wardrobes to make a visually striking statement against Trump. 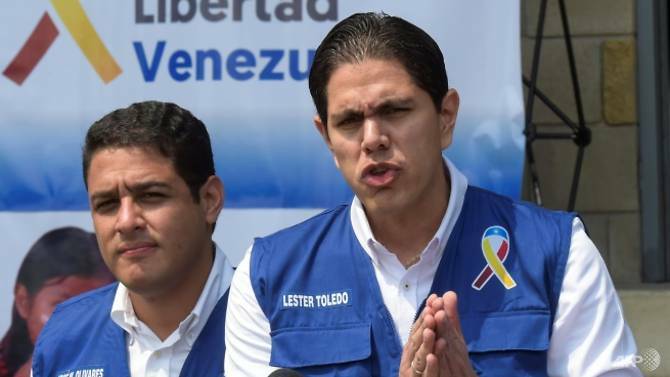 "The Venezuelan people are going to unite in a humanitarian corridor, civilians hand in hand with soldiers," said Lester Toledo, the head of that team. A small group of Venezuelan protesters on the Colombian side of the border bridge - expatriates who are among the 2.3 million people to leave the country since 2015 - is sending the same message. "Soldier, friend, we're counting on you," said a sign one of them was brandishing. "We didn't want to leave our country, which we love, but the situation forced us to. Our children are hungry, we have no money," said demonstrator Eduard Guzman, clutching a sign asking soldiers to let the aid through "now, now, now." "We need it, we are suffering," said Guzman.